It didn’t take long for Nvidia’s monstrous Tesla P100 GPU to make its mark in an ongoing race to build the world’s fastest computers. Just a day after Nvidia’s CEO said he was “friggin’ excited” to introduce the Tesla P100, the company announced its fastest GPU ever would be used to upgrade a supercomputer called Piz Daint. Roughly 4,500 of the GPUs will be installed in the supercomputer at the Swiss National Supercomputing Center in Switzerland. Two of the world’s ten fastest computers use GPUs as co-processors to speed up simulations and scientific applications: Titan, at the U.S. Oak Ridge National Laboratory, and Piz Daint. The latter is used to analyze data from the Large Hadron Collider at CERN. The GPU has a peak floating-point performance of about 21.2 teraflops, which is almost twice as fast as Nvidia’s Tesla M60, a top-line GPU based on the older Maxwell architecture. The new GPU is also the first with Nvidia’s homegrown NVLink interface, which can transfer data five times faster than PCI-Express 3.0. An earlier version of this story mischaracterized the Piz Daint project. The supercomputer already exists and is being upgraded. 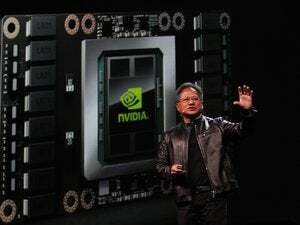 It also misstated Piz Daint’s peak performance, which is 7.8 petaflops, and misstated the number of Nvidia DGX-1 computers required to reach 2 petaflops.